In the past, walls were decorated in some fashion, usually by painting directly upon the plaster. Later, tapestries, silk and paneling took the place of this fresco work and in the homes of the wealthy, giving a beautiful decorative background for the architectural finish and detail of the other furnishings. Cottages and smaller homes in the early Victorian era were ordinarily plain plaster. Distinctions in social standing were apparent in the differences between the furnishings and wallcoverings of a grand mansion and farmhouse. Machine made paper arose in the 19th century, with the more exquisite patterns featuring designs by Walter Crane and William Morris. Walter Crane was one of the most important designers of the Arts and Crafts movement. He developed his figurative style through his picture-books for children, for which he is famous. The best known of his works, Baby’s Opera and The First of May are revelations in their own way. But Crane was always, and in everything, a decorator. His gift as an ornamental designer and decorator are apparent in his Walter Crane Arts and Crafts designs in Victorian wallpaper. Crane designed many exquisite patterns of wallpaper, some which are still reproduced today to decorate homes. Crane designed elaborate schemes of decoration in wallpaper — friezes, fields, dados, and ceilings — block-printed or stamped and gilded. 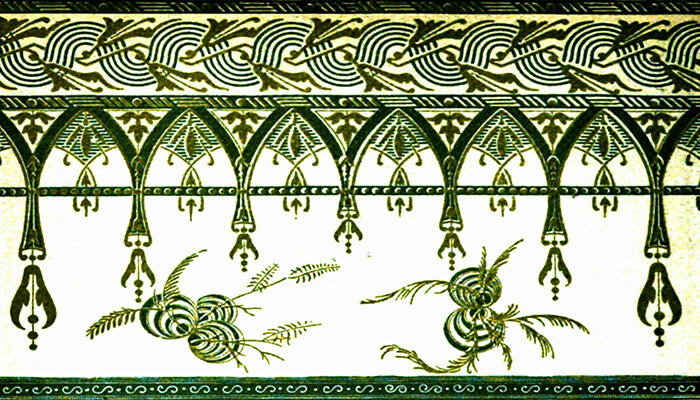 This is an example of an 1889 wallpaper decoration in Elder’s Granites. The color represented is one of twelve available in their line of embossed wallpapers. No. I — An intricate wallpaper pattern with a cream ground with embossed golden wheat and blue corn-flowers. No. 2 — A warm cheering paper featuring a bright saffron scale pattern with saffron floral scrolls on a dark yellow ground. No. 3 — Somber mosaic arabesque wallpaper in dark red, blue and green, all on an old gold mosaic ground. No. 4 — Victorian wallpaper highlighting golden vases with garlands of flowers on bright Nile blue and cream grounds. 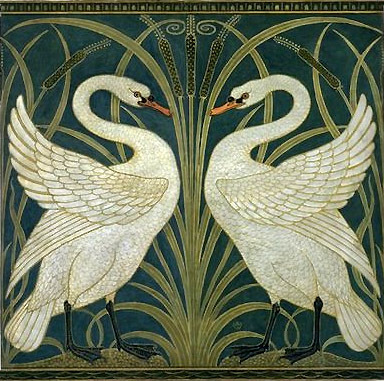 Walter Crane Wallpaper Design "Swan Rush and Iris"
No. 5 — Wallpaper with a charming suggestion of nature featuring ponds of gold and green wavelets with gold and green waterfowl, lily pads, leaves and sedges interspersed with ferns and gray-green buds, berries and leaves, with clusters of pink and gold wild roses, all on a gray ground. No. 6 — Gold leaves and stems springing out of an emerald-green oval panel outlined in thin bands of brilliant pale scarlet on a dazzling maroon ground. N0. 7 — A shimmering white Arabic flock design on a pale vitreous sea-green ground. A wallpaper pattern full of culture, poetry and beauty. No. 8 — Heavily-stamped plush wallpaper with large rich figure of creamy white, on a ground of coppery gold, forming, perhaps, the noblest and most beautiful combination of all colors. No. 9 — A Japanese leather paper on which vines with spreading leaves, tendrils and fruit were embossed and colored in imitation of carved ivory. Every twig and tendril was as sharp and solid as if laboriously carved from the ivory itself. No. 10 — A Japanese inspiration wallpaper pattern with a flight of cranes on a salmon-trout-colored ground, with intertwining foliage of willow green, the cranes deep violet and black, with the light figured on their wings by gold reflections, the conventional Japanese apple blossom with gnarled and knotted wood on a ground of mat gold, imitating lacquer. 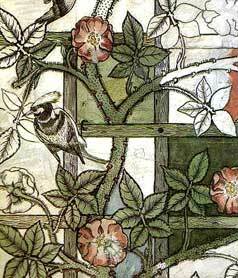 William Morris led the Arts and Crafts movement of the 1860s to 1910. Morris set up his own company with fellow artists called Morris, Marshall, Faulkner & Co in 1861, (later just Morris & Co), which produced everything from furniture and textiles to wallpaper and jewelry. Great pains were taken by William Morris personally in the preparation of pure and lasting colors, nothing being spared to that end; some of his vats requiring years to bring their dyes to perfection. William Morris Victorian Wallpaper Designs, bearing the stamp of his strong color sense and sobriety of taste, notwithstanding many imitations are inimitable. William Morris wallpaper of the 1870s were peculiarly unique both in coloring and design, the latter from Morris's own hand, the former under his special supervision. One of the leading mid-19th century houses in furniture decoration was the firm of Messrs. Jackson & Graham, who retained the services of Owen Jones, and it was under his control that shortly before 1865 they completed the decoration of the Viceroy's Palace, at Cairo, for which he designed a most elaborate series of wallpaper decorations, based on Persian ornament. These were printed by Jeffrey & Co., who were so impressed with the character of his designs that they decided to make one of their principal exhibits at the International Exhibition in Paris, 1867, the Owen Jones' Pilaster Decoration, and thus prove that English paperstainers were no longer under French influence. Today's homeowners can preview and interact with a paint manufacturer’s color swatches and products to virtually create the room of their dreams long before picking up a paint brush with the help of mobile paint apps for both iPhone and Android platforms. 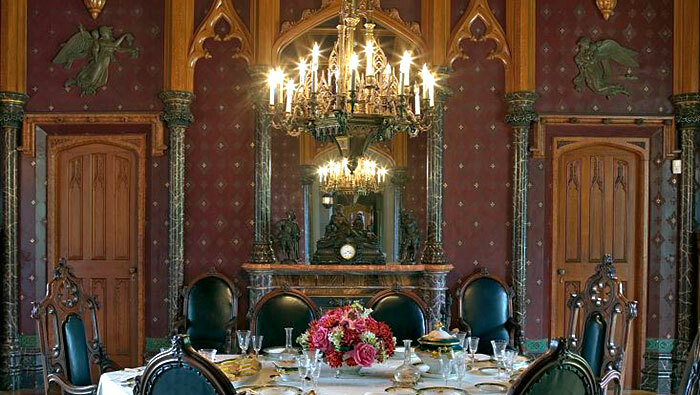 When painting a Victorian style room, color has the power to alter the apparent proportions of a room. Red contracts, blue and yellow expand. Green, unless very dark, has little effect upon, the room, keeping the walls, as decorators say, well in place. 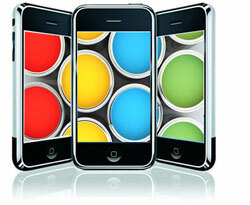 Tan, gray, blue and pink have the effect of adding space, while brown, unless very light, has the same quality as green. Are you a "do it yourself" decorator? Learn how to select wallpaper designs for your home. Many excellent reproductions of Victorian wallpaper are available and they are as pleasing today as they were over a hundred years ago. Printed wallpaper for the Victorian 1900 house featured designs for the entrance hall, dining room, living room, morning room, bedrooms, a nursery, and kitchen. These wall coverings — handsome, dignified, and decorative — still occupy a first place in Victorian style houses where the decorative quality of woodwork and furniture can stand their massive weight, sturdy, vigorous line, and handsome rendering. They do, however, require for the most part, heavy massive woodwork, wainscoting to chair rails, deep toned colors in hangings and upholstery, and decorative chairs of the later periods. Nevertheless, their adaptation to more modern homes can be made with care and thought. 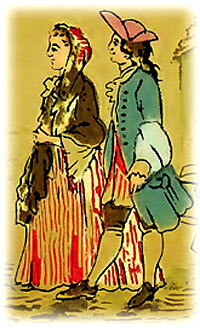 Antique wallpaper of expensive styles and artistic variety were brought to America as early as 1735. Rolls of wallpaper did not appear in America until 1790, so most designs imported before this time arrived in square sheets. 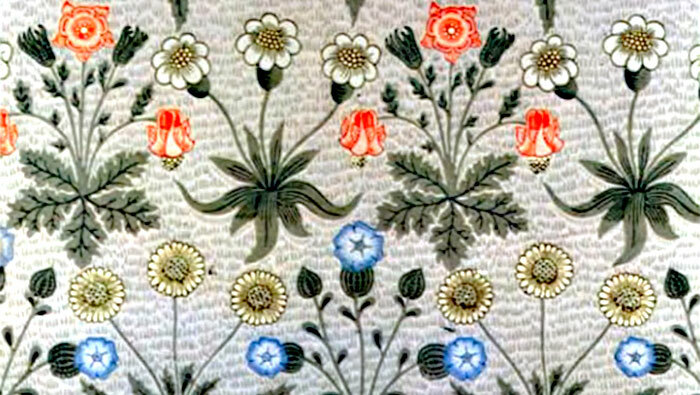 French influence dominated the design of domestic wallpapers; but by the end of the eighteenth century, Philadelphia had become the center of wallpaper production in the United States. Many collections of Regency wallpaper designs are reproduced today including wallpaper patterns and border samples from the circa 1815 period. Various wallpaper designs were produced by the Philadelphia firm of Messrs. Virchaux & Co.